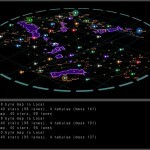 A long time ago (1999) in a galaxy far, far away (Somerville, Massachusetts) Infinite Space began as a computer game of starship battles and galactic empires, the stuff of classics like Stellar Conquest and Master of Orion. The design was comprehensive and detailed. The scope of the game was ambitious. But it proved too much for two people already working full time, so the project stopped. It was time to go back to the drawing board! All was not lost. In fact, a whole “universe” had been created with futuristic technologies, bizarre alien races, a vast history and many strange tales to tell. Then while reviewing this material, the recollection of a van Vogt novel, The Voyage of the Space Beagle, an abiding fondness for roguelikes, and a brief look back at a few space adventure boardgames from the 1980s provided needed inspiration and helped to pull a new type of computer game design sharply into focus. Strange Adventures in Infinite Space was released in 2002. 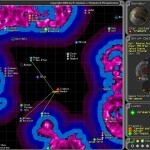 The cumbersome 10 player 4X wargame design had been scrapped in favor of a brisk single player space adventure. Roguelike traits predominated, like random universe generation and permadeath. The hook was that game sessions were short, less than 20 minutes, while conveying the essence of a grand space opera. Weird Worlds: Return to Infinite Space, an updated and much expanded sequel, followed in 2005. Both games were well received by gamers and critics alike. Strange Adventures has the distinction of being the first game of its roguelike kind. Weird Worlds was prettier, sounded better and in many ways took the game to a next step and so, to a larger audience of space gamers. Weird Worlds remains Digital Eel’s best known game. Since then, several Infinite Space themed tabletop games have been created. Diceland: Space, by James Ernest and Cheapass Games, was released in 2005. Eat Electric Death!, based on the starship combat component from Weird Worlds, was finished in 2007 but has yet to be released. Space Ludo, a family game for kids, was released in 2009. Most recently, Infinite Space Explorers, a casual card and board game loosely based on SAIS and WW, was released in 2012 via The Game Crafter. As is hinted at in Weird Worlds, it all started with a brick. Where will it end? What a silly question to ask. After all, in Infinite Space anything is possible. Weirder worlds must exist and await investigation. And so, stranger adventures are bound to be embarked upon. Until then, watch the skies!